World of Innovation — Our personalized instruction and creative use of technology prepares students to solve the challenges of tomorrow. We provide unique open-project learning spaces; fully equipped science and design labs; an integrated coding and robotics program; and thorough exploration of the data-driven world. World Languages — We emphasize multilingualism at GEMS, starting with our youngest learners. Our students receive daily instruction in French, Spanish or Mandarin, and our classes, fully aligned with the International Baccalaureate curriculum, act as catalysts for enhanced cultural understanding and global connections. World Culture and Exploration — Students at GEMS World Academy Chicago are part of a global network of elite education institutions. We place a premium, through the GWA Connect travel program, on providing students with opportunities for authentic travel and cultural exchange experiences, using our companion GEMS World Academy schools overseas as partners. World As Our Campus — Our students interact with the world around them in rich and meaningful ways. The Field Studies program leverages the entire city of Chicago, which our students explore in self-directed inquiries. Strategically articulated curricula extend these experiences to global contexts. World Citizens — Global citizenship is a core value for GEMS Education. Our program provides students with an intuitive sense of the world's complexity and diversity. Students grow to understand that a range of thought and experience is absolutely essential to making discoveries, driving innovation and taking leadership roles on the world stage. At GEMS World Academy Chicago, we believe that education extends far beyond four walls. Each and every day, our students experience unique ways of learning that inspire new perspectives. They are infused with an excitement and passion that is unparalleled and enhanced by the innovative technology integrated into our state-of-the-art campus located in downtown Chicago. As Illinois' only private school offering an accredited International Baccalaureate Primary Years Program curriculum, our students grow through the strong connections they build with other students around the globe as well as frequent engagement with professionals and institutions in the rich cultural center of Chicago. GEMS World Academy Chicago is the first Preschool-through-12 school in the United States from the international award-winning educator GEMS Education. GEMS World Academy Chicago — Early Years, a culturally diverse preschool that nurtures a child’s love of learning and creativity in Lincoln Park, is also part of the GEMS Education network and serves children as young as 6 weeks old. Our master teachers exemplify excellence in the classroom. Our educators recognize the importance of inspiring students, driving industry-changing innovation as well as enriching the communities in which they live and work. An International Baccalaureate World School curriculum. GEMS offers a rigorous, accredited Primary Years Program and is an official candidate school for the Middle Years Program. Inquiry-based learning: fostering an atmosphere of academic excellence and encourage intellectual inquiry and critical thinking. Physical, expressive and creative arts as an essential part of a holistic education. Highly experienced international educators, committed to providing outstanding learning opportunities. Authentic curriculum links and projects with schools from the GEMS network around the world, developing international-mindedness. GEMS World Academy Chicago comes with significant and established connections to classrooms across the globe through the GEMS Education network of schools. Each classroom within our campus functions as a portal to a global network where children work together to explore themes, ideas, and issues from multiple perspectives. GEMS Education schools span four continents and educate more than 270,000 students from more than 176 countries. When we speak of connecting to classrooms across the globe, it is more than rich exchange programs or special community projects abroad. We offer daily integration with classrooms and interaction with peers so that students can build genuine relationships and understand different cultural perspectives as they learn and prepare for life. All of our head teachers hold master’s degrees or post-graduate certificates in Education. Our faculty have studied and taught on six different continents. Prospective parents will spend an average of nine hours with our admissions staff, receiving guidance and support through the decision-making process. GEMS World Academy Chicago uses an inquiry-based approach that combines rigorous academic study with a truly international perspective. 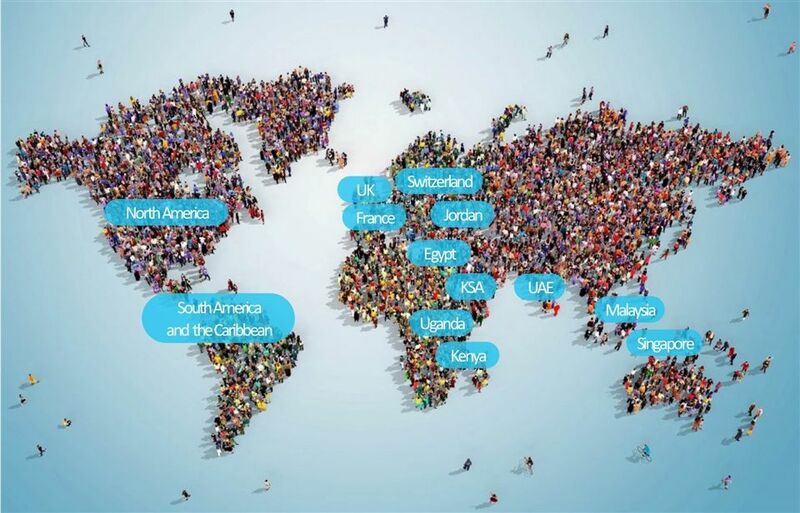 A global network of schools, GEMS Education links hundreds of thousands of students across four continents to collaborate and build meaningful cross-cultural connections. Students from GEMS Education schools have been accepted into some of the finest colleges and universities around the world, including the University of Oxford, Trinity College in Dublin, Harvard University, the University of Chicago, and the University of California at Berkeley. GEMS' Chicago campus features interactive touchscreens to facilitate cross-cultural collaboration with GEMS Education schools in other countries. 1:1 iPad Mini-to-student ratio to be used for note-taking, reading, and research in support of Field Studies and mobile learning. We offer ten different after-school programs ranging from language arts to fencing, and are expanding our offerings. Founded in 1959 by two teachers and now in its third generation of ownership, GEMS Education has grown from a small family-run business to a multi-national company with global reach and reputation. 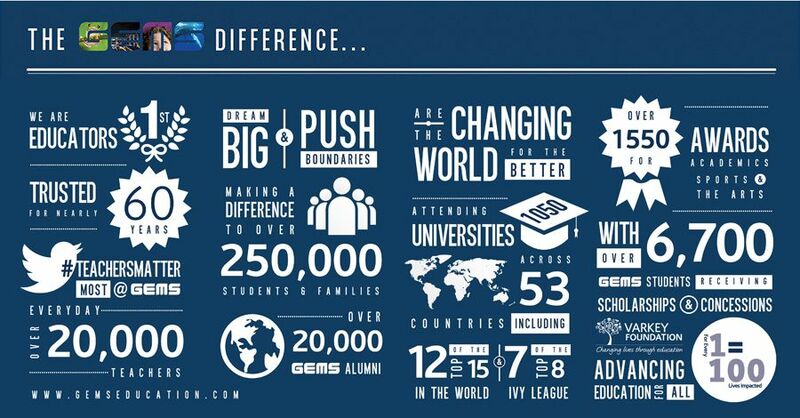 GEMS Education’s offices are located in New York, London, Singapore, Delhi and Dubai. GEMS Education has a global network of international schools in Europe, Africa, North America, Asia and the Middle East. We educate more than 250,000 students from more than 170 countries and employ more than 20,000 education professionals, specialists and staff. With countless opportunities for interactive studies with their peers around the world, our students expand their knowledge and broaden their experiences with other cultures. To achieve our vision, GEMS Education partners with organizations and international agencies that share our commitment to promoting access to quality education for children across the globe. Our partners include UNESCO, Clinton Global Initiative, Tony Blair Faith Foundation, The World Economic Forum, and Pratham. In honor of GEMS Education’s 50th anniversary, the company launched the Varkey Foundation, a philanthropic organization dedicated to improving the standards of education for underprivileged children throughout the world. The foundations pursues this goal via advocacy and teacher-training programs. At the launch of the foundation, President Bill Clinton, honorary chairman, said, “There will rarely be people who launch something with so much potential to lift the hopes and spirits and dreams of children as this foundation has done tonight. The benefits from an educated child will affect not only the child itself, but also his or her family and the wider community. The Varkey Foundation’s commitment will bring that opportunity to millions more children around the world." The Varkey Foundation has worked diligently to celebrate excellent teachers around the world and inspire young people to enter the teaching field. One of the key components of that effort is the Global Teacher Prize, a program launched in 2014. The foundation grants a $1 million award to a teacher who brings innovative new approaches to the classroom, inspires his or her local community and advocates passionately for the entire profession. The top 10 finalists for the 2018 prize came from both public and private schools around the world. 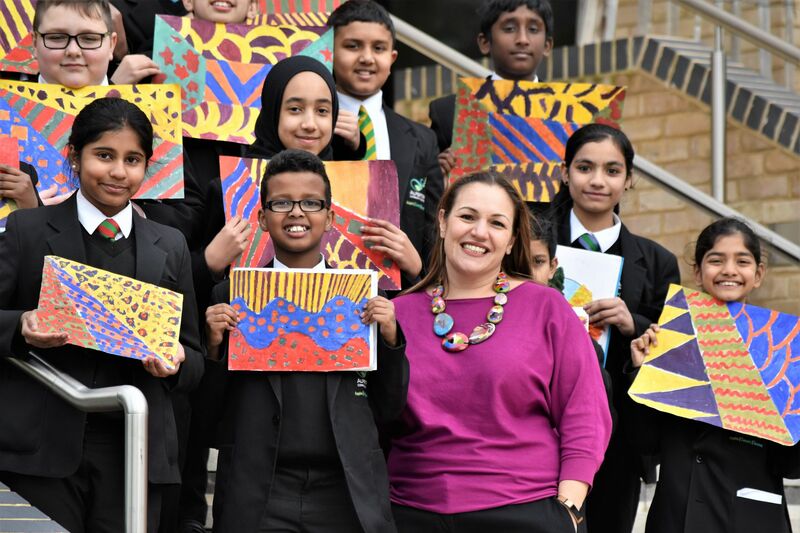 Andria Zafirakou, who teaches inner-city students in the United Kingdom, was named the $1 million winner during the annual Global Education and Skills Forum in Dubai in March of 2018. For more information, go to the Global Teacher Prize website.